For the last 5 years, there were created over 300 millions of sites with the help of online website builders. 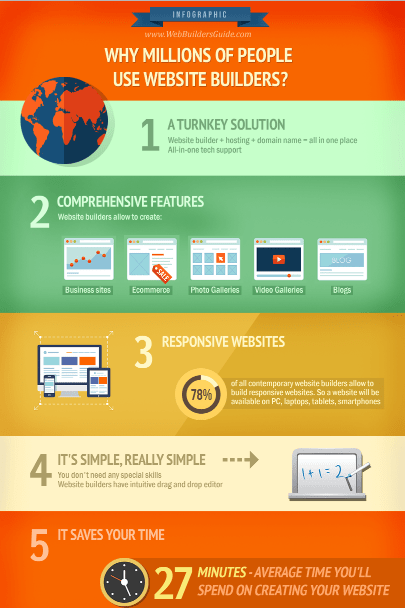 This infographic is a visual result of our research of popularity fo website builder software among webmasters. We've decided to find out - what are users reasons to choose website builders as a tool for website development. And what it is necessary to note, that it's far not always the beginning webmasters. The main advantage of SaaS platforms comparing to CMS with open code - is a product concept "all-in-one". That's why the user doesn't need to separately buy web hosting, domain name, a website itself. Everything is integrated into one platform and can be set up quickly and unbelievably easy. In fact, simplicity and ease of use - is the second undeniable advantage of website builders. If we compare website builders with the most popular and easiest CMS in our time - WordPress, then you will need basic HTML knowledge and even some programming skills. The webmaster will also need to know how to set up a database, how to upload a WordPress theme to a hosting, how to connect domain name and hosting, how to install plugins and many other "how to" which most of the people don't know. The third advantage is a time spent on website development. It's obvious that website builders allow getting a ready website much faster compared to any other way. Literally, within minutes you will be able to get a modern one-page website. The fourth advantage is a budget saving. Since many website builders are free and the cost of premium ones is commensurate with the cost of standard shared hosting - this allows saving lots of money on website development. Also, there are such powerful website builders (for example, Shopify) which allow getting incredibly advanced websites for business. Development of similar website from the scratch will be hundreds or even thousands of times more expensive. And the result - always less predictable. Of course, these are not all advantages of online website builder software. We're sure, that the feeling experienced by a person who created a website by himself - also has a big meaning. With website builders you don't need anyone to create a site - you build your website as you see it. You are a creator. And this is great!